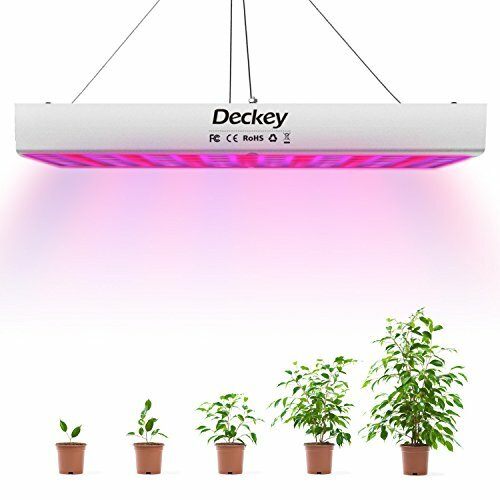 ✿Deckey plant grow light is designed to produce the most efficient wavelengths of light to produce peak photosynthesis. ✿The plant grow light is designed to produce the most efficient wavelengths of light to produce peak photosynthesis. ✿Plants do not use the entire spectrum of light,the chlorophyll and carotene only absorb the light at the range of two particular wavelength(blue 460-470nm and red 620-630nm). ✿This LED plant light is suitable for bananas, flowers,seaweed,green peppers, eggplant, bitter gourd, tomatoes, grapes, lettuce, lettuce and other herbs, vegetables, flowers, plants and plant tissue culture. ✔This plant light can replace 3 to 5 times the power of high pressure sodium than traditional high pressure sodium and metal halide lamps can save 80% of energy. ✔With 60 blue and 165 red light, the LED grow light gives off both red and blue light which is important for maximizing growth in plants,the red light is good for budding,flowering and fruiting when blue light is to promote leaf. ✔With thick aluminum plate substrate compared to conventional glass filler panels easy maintenance,better thermal conductivity,the product of all the materials used ring to meet environmental requirements,do not contain mercury,lead and heavy metals harmful substances. RED AND BLUE LIGHTS: Blue lights help to stimulate stem and leaf growth, red lights stimulate flowering and seed germinates,this plant grow light ensures that your plants grow healthy and lush. LOW POWER CONSUMPTION:The LED growing light can save at least 80% in energy costs compared with high pressure sodium and Incandescent or metal halide lamp,90% of the light can be utilized by the plants. PRACTICAL AND SIMPLE DESIGN:Deckey LED Grow Light is widely used in greenhouses, plant factory, greenhouse farming,flower farming, indoor gardens, water soluble breeding, pipeline cultivation, farm, potted plants, spray the plant, tissue culture and so on. LED PLANT GROW LIGHT SIZE:12.2*12.2*1.4 inch(31*31*3.5cm),suggested Irradiated Distance: 1.64ft-3.28ft /0.5m-1m,irradiated area: 26.9 square feet/2.5 square meter. If you have any questions about this product by Deckey, contact us by completing and submitting the form below. If you are looking for a specif part number, please include it with your message.